Ion mill system to define structures through a photoresist or hard mask on 1 inch substrates. Two independent fluximeters allows the operation with a beam neutralizer. The rotating sample holder can be tilted up to 60° with respect to the ion beam. 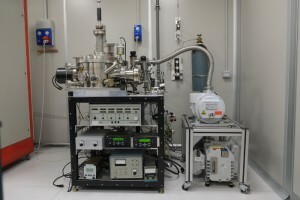 The system is also equipped with an ion source (3”) for reactive magnetron sputtering (Ar and N2). Thickness uniformity of ±3 %.